If you’re a small community bank or mortgage lending institution in Illinois, you know that the opportunities are all there for you to succeed. There are not only residential and commercial opportunities throughout Chicago, but also business, home and agricultural lending possibilities all throughout the state. To take advantage of them, though, you need to have a streamlined loan generating process. Unless you have an efficient way of building a portfolio of healthy loans, it can be very difficult for an Illinois community bank or mortgage lender to succeed. One way many Illinois banks and lenders are dealing with this problem is by finding a reliable Illinois appraisal management company like SAMCO Appraisal Management Company. SAMCO takes some of the pressure of trying to comply with federal regulations off your staff while helping ensure you properly value your loans. One of the leading complaints of small banks trying to succeed in Illinois is that they are being strangled by regulations. Fair lending laws are important, but trying to stay in compliance can be a huge undertaking. If you have a bank or lending institution in Illinois, it may seem like everywhere you turn you’re facing another regulation. Regulations that were put in place after the 2007-2008 recession are now your problem. But they don’t have to be. Having to deal with suffocating regulations is one of the most important reasons to engage the services of an Illinois AMC like SAMCO. Among the many important valuation products and services we provide is a comprehensive review process that can affordably help you stay on top of USPAP requirements for your loans. The last thing you need is a compliance issue holding up your loan or threatening your company. SAMCO can do a compliance audit to help you make sure you are protected. We also put up a virtually impenetrable firewall between our appraisers and your loan officers, so you never have to worry about them crossing paths and putting you in a conflict situation. Our valuation products and services also include custom reporting with real-time data as part of a customized appraisal management program so you can put your appraisal concerns on autopilot. Your business is structuring and offering loans that help your community while generating profits for your company. You’re not in it to spend countless hours and dollars trying to deal with appraisers, appraisals, valuations and compliance officers. 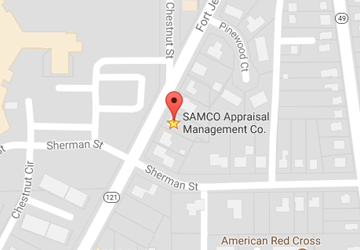 With SAMCO as your Illinois appraisal management company, you don’t have to. Let us take care of all of your evaluation and appraisal issues so you can concentrate on what you do best: giving out quality loans. If you’re ready to let us help you streamline and protect your lending operation, all you have to do is give us a call now at 888-832-1129 or contact us online today.